FABULOUS 6BD VILLA W/PRIVATE POOL AND GARDEN IN GREAT CENTRAL FLORENCE LOCATION! 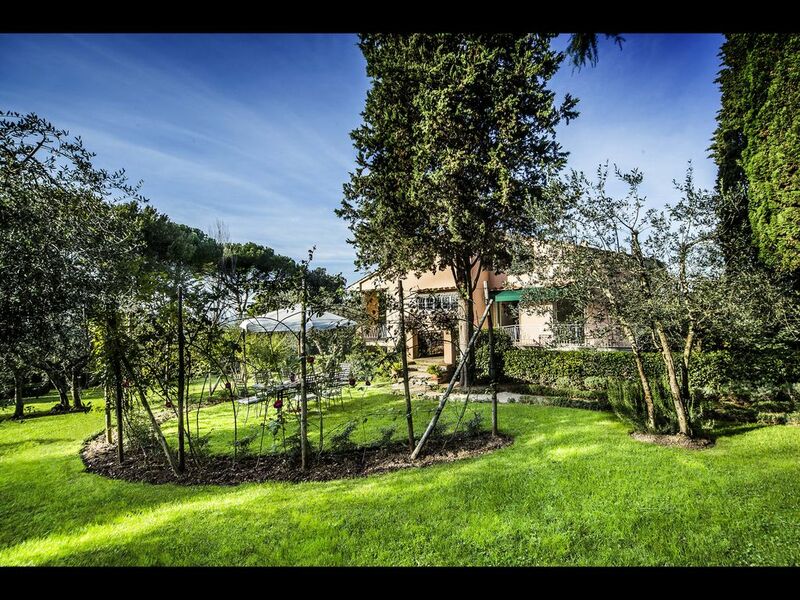 This wonderful 6 BD - 4.5 BA villa is located in the exclusive "Bellosguardo" area of the city of Florence. Being only about 1 mile away from the beginning of its historic district, the villa is ideally located to visit Florence as well as all of the other beautiful locations in Tuscany (such as Siena, San Gimignano, Pisa, Lucca, etc). The property overlooks fantastic views of the city and features a large private pool as well as an immaculately kept garden. Each living space has been exquisitely appointed directly by the owner to create a cosy yet elegant and sophisticated atmosphere. The estate offers its guests a truly unique blend of indoor and outdoor living, providing the perfect setting to enjoy an unforgettable holiday with family & friends and caters to those who are ready to mix relaxing time with the exploration of the most wonderful places in the area. With its 6 wonderfully decorated bedrooms (all air conditioned), the villa offers the ultimate accommodation for your dream Italian holiday! The careful attention to details, such as the marble, the selection of fabrics chosen, the exquisite furniture and last but not least the landscaping, all contribute into making the property a truly unique place. The villa spreads over 3 floors (ground, first, and second) and is more than 4300 square feet in size, with a total of 6 bedrooms and 4 and a ½ bathrooms. There is also a large sitting room with a 50” TV (with satellite channels), which opens up to the garden, as well as a fully equipped laundry room (with washing machine, tumble dryer and iron). A staircase leads up to the first floor, which is also the main entrance level. Here there is a master bedroom with an adjoining bathroom (with a separate tub and shower), shared by another bedroom (setup either with a king bed or two twins). This floor also features a living room (with fireplace, sofa and armchairs), a dining room (equipped with a large dining table and chairs) and a fully equipped kitchen (which is located across from the dining room). A further flight of steps leads up to the top floor, which is currently a study with a powder room. The villa sits on one hectare (2.4 acres) of garden, with a large lawn at the front and an area dedicated to al fresco dining (seating up to 12 persons). A private pool of 10 meters by 5 (32 x 16 feet) is located in the garden at the far end of the property (the pool area is equipped with several new teak sun beds and umbrellas). There is also plenty of gated parking available. The villa’s gardeners are on duty twice a week and also look after the maintenance of the pool. All bedrooms and living areas are air conditioned (with top quality A/C units). There is also a WI-FI connection throughout. Location details: The villa is located just a short walk away from the beginning of the historic district of Florence. The nearest bus stop is located about 0.9 of a mile away (right where the historic district begins), and can be reached on foot in just about a 12-15 minute walk. To reach the heart of the center of town on foot (like for example the Pitti Palace or the old Bridge) it takes about 22-25 minutes. Distances: To name a few examples, the main train station of Florence (Santa Maria Novella), world renowned Ponte Vecchio (Old Bridge) or the Uffizi museum are all located just about 1.8 of a mile away from the villa; the Pitti Palace and the Boboli garden are just about 1.4 mile away. So from the villa it is possible to quickly and easily reach the heart of the historic district of the town either by taxi, by car, by bus or even on foot. The nearest supermarket (Carrefour Express) as well as 3 excellent restaurants/trattorias, cafes, grocery stores and a bakery are all within a 12-15 minute walk away from the property (about 0.9 miles), at the same location where the bus stop is. You definitely need more than a week at this property to really appreciate everything! No one in our group of 11 wanted to leave, we were all having such a great time!!.. The adults took full advantage of the chef service, cooking classes and wine tours while the younger group toured museums and did a lot of shopping (there are great fashion outlets not too far away). The owner has extensive knowledge of all the fun things to do within Florence and the surrounding areas, her recommendations were all fantastic! We stayed over Christmas for 10 nights and found a wonderful Christmas tree inside the house upon arrival, which was a truly great surprise! We really enjoyed the surrounding views, I had no idea you could be so close to the heart of Florence and surrounded by the most beautiful countryside at the same time.. From the villa we could just walk to the heart of town, without having to worry about taking the car. Our vacation really couldn't have gone better and was exactly what we needed, we are already looking forward to our next trip! What a great villa in a fantastic location, we truly loved this property and had the most wonderful vacation ever! We spent a week over Thanksgiving with the entire family (including grandparents) and there was really nothing missing at the villa, it had all of the amenities that our group of 10 guests needed! The owner couldn't have been more accommodating, she knew everything about the local areas and beyond and provided lots of useful information. Some nights we picked up local, authentic Italian groceries from the nearby supermarkets to cook dinner ourselves, other nights we went to delicious restaurants that the owner recommended in her helpful guest booklet. On Thanksgiving day, we had the villa’s recommended chef cook for us, it was the best meal we have had in Italy by far! We also did a cooking class all together, which was a lot of fun, with Italian music playing in the background! This property caters to everyone's needs: it is located so close to the city center it really doesn't matter if everyone wants to do separate activities, as you can easily meet up during the day or back at the villa. It took us about 10-15 min to get from the villa to the center. When we were tired we could easily come back and meet the rest of the group later. I cannot recommend this villa enough! Thank you for a wonderful stay, we will definitely be back! Wonderful villa! We were a group of 5 couples visiting Florence for a long weekend. The property was just as described on the site plus more, the surrounding views were absolutely gorgeous, the home had everything we needed, and it was so easy to reach the city center... it really exceeded our expectations! We will definitely be coming back in the Spring for another visit, thank you for all of your help and for an incredible stay! So I stayed here with my fiancé and 17 couples (coming in and out) over three weeks in October of 2018. The property is an original villa with exceptional views. There are a few drawbacks though: the kitchen is small, so cooking dinner was a bit troublesome with a few wanting to cook. The pans were all but one unusable. The fireplace can't be used due to the age of it ?!?! ?, if you do not have a car here, good luck getting a taxi when you need it, the address is confused by another address up the hill and that is if taxi's come at all (and we used the app daily). The short walk that is listed to get into town is at a 40 degree angle, so if you have any that are slow or have trouble walking, it is difficult. The walk up is the absolute killer though. With no car, a taxi is your only hope while carrying groceries. There is a Carrefour (grocery) at the hill bottom the locals use, but this is not a fresh market. Overall it is a total of 45 minutes to walk into Florence. The road to the property has many one lane areas, so starting at 7am, cars beep to go around corners - this is only a problem as the house echos like nothing you can imagine. The lower level is musty, but the caretaker said that is just the age - we saw visible mold in places. The pool is not heated either, so if the temp is below 70, it really isn't usable. The owner once you book is checked out, she passes the work to Emma, a caretaker. Emma speaks primarily Italian, so the language barrier proved difficult. There were also extra charges you need to be aware of. If the maid (she spoke no english at all, and she scheduled all cleanings with us) needs to come more than every Wednesday, there is a charge per - there is also a daily charge per guest and the final cleaning fee was raised this was all a surprise to us from the original booking, so make sure you ask if staying here. There is a washer and dryer, but they are small and took all day to operate for a load. There are a few restaurants at the bottom of the hill, but one of them took advantage of our group and charged triple the rates for drinking just wine and not eating, another got outright mad and started cussing in Italian when we wanted just wine and no food. I would rent a villa 30 minutes from Florence in a vineyard and have a large van to get people to and fro for tourist activities. The drawback there is there are no taxis to call at all, over an hour wait. We were in Florence for a small intimate wedding, and this was a perfect villa to house the groom’s family. Easy 20 minute downhill walk into historic area of Florence. The home has a very spacious garden/lawn to enjoy, balconies overlooking the city, a kitchen that we made full use of, and quiet and safe atmosphere. We would definitely rent again! Perfect location. Beautiful accommodations. Close enough to walk in, yet far enough to overlook the city. I highly recommend.